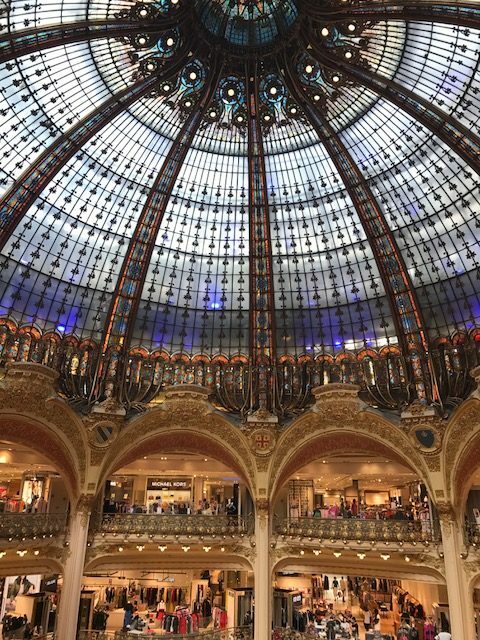 Usually packing to go overseas can be quite frantic as I try and get my entire family packed up for a holiday but my recent work trip to Paris was a different story. 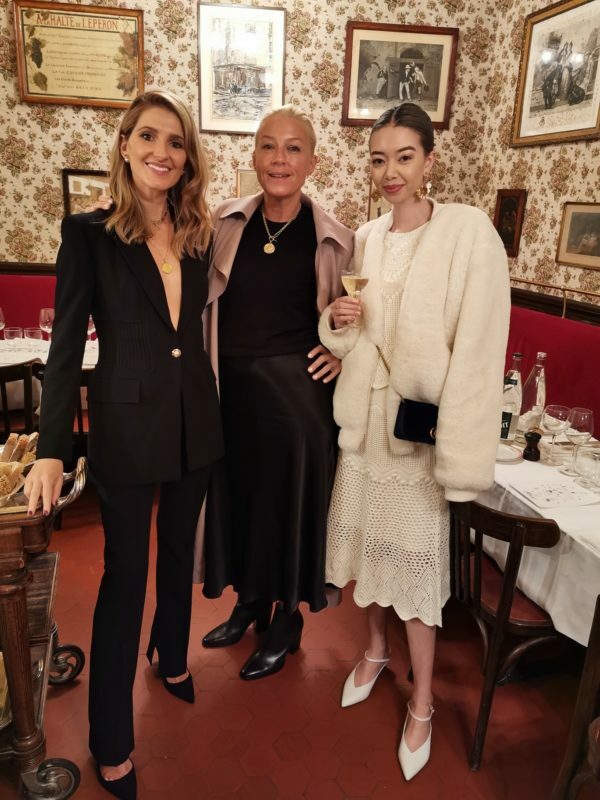 I was lucky enough to be invited to attend the global launch of the new Huawei P30 in the City of Light so it was the perfect excuse to pull together a few outfits incorporating some of my favourite new season pieces from my go-to Aussie designers. 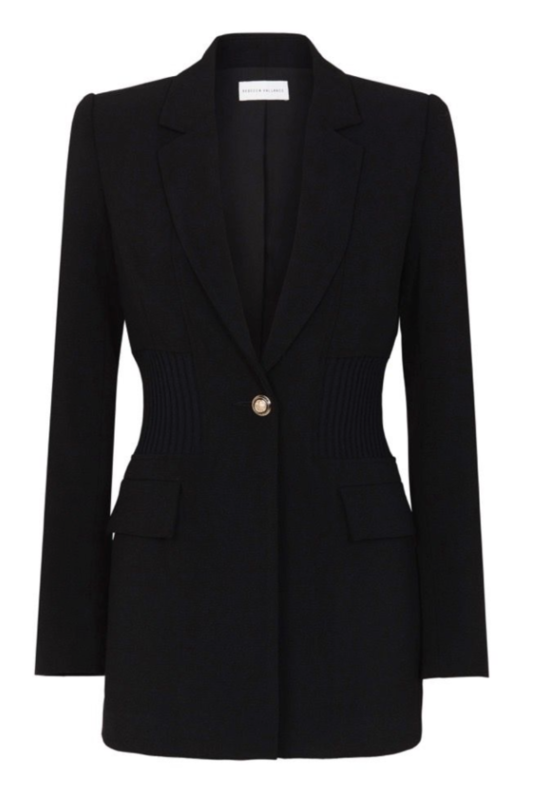 I’m really into suits at the moment and I love the cut of this one by Rebecca Vallance. I opted to wear this as a two-piece set and dress it down and make it sightseeing appropriate by pairing it with baby pink Chanel sneakers. When it comes to suits I’m really into double breasted jackets as I find they’ve got a modern sensibility to them. The cropped trousers also add a more relaxed feel to the outfit. The great thing about this look is that I could easily dress it up by simple swapping sneakers for heels. For breakfast at the insanely beautiful Peninsula Paris, I wanted a look that was casual yet polished. I don’t think you can ever go wrong with the classic pairing of a white shirt with jeans. 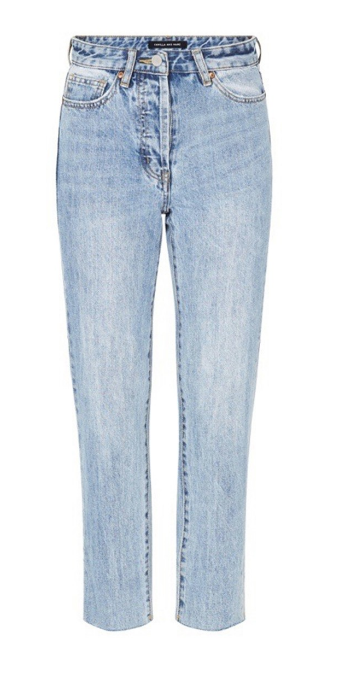 These Camilla and Marc jeans have been so versatile and are just the perfect cut and as such I’ve been wearing them constantly. 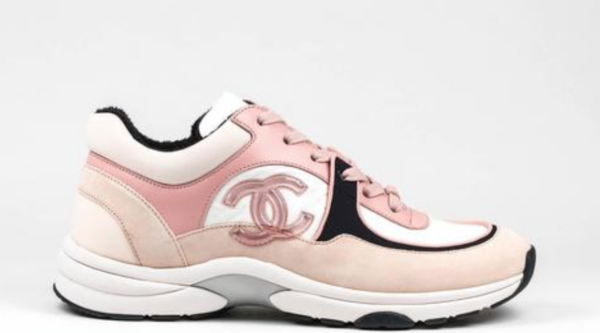 The white shirt with its slightly billowy sleeves made for a dressy companion for denim, and paired with my new go-to Chanel sneakers, it was an on trend look that still maintained a dressy feel. 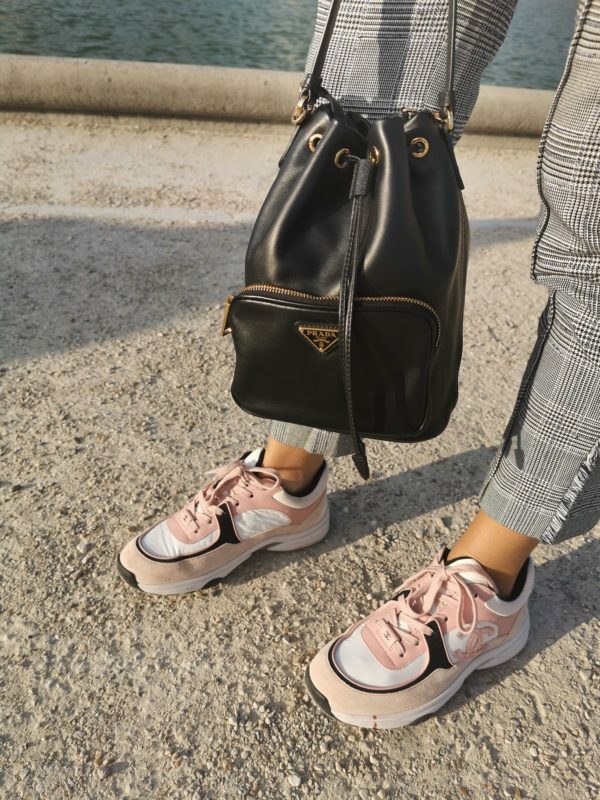 My new Prada bag was also great for the trip as I was able to pair it with virtually all of my outfits and I could carry it via the handle or strap, making it perfect for sightseeing. 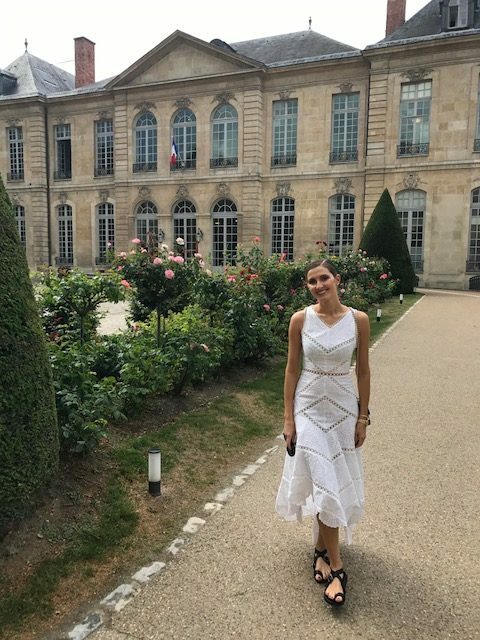 For a trip to Versailles I wanted to dress up a bit but also wanted to remain comfortable so a dress seemed the perfect choice. 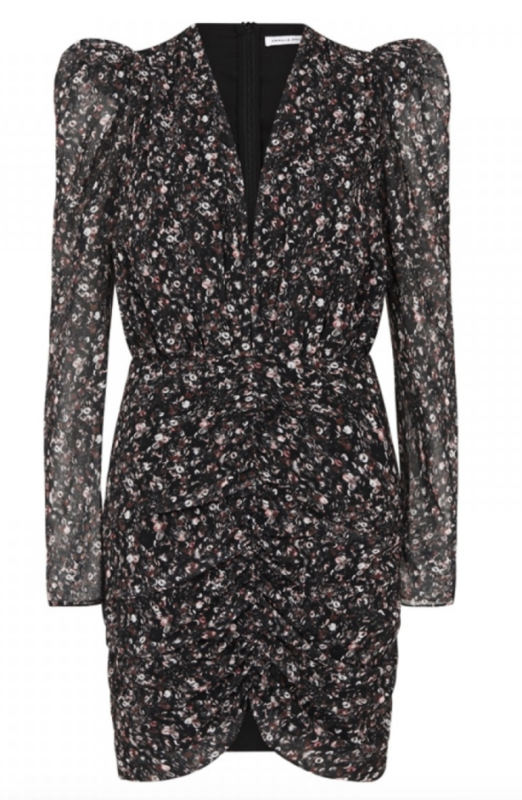 I love the print and silhouette of this Camilla and Marc mini dress, but wanted to give it a little extra shape so I decided to cinch it in with one of my favourite belts by Isabel Marant. It was still slightly chilly during my time in Paris, so I decided to go for over the knee flat boots by Stuart Weitzman and a red faux fur coat to snuggle up in. My pink Bulgari bag allowed me to carry all my essentials but minus the fuss of actually having to carry a large bag. Also I was able to use the same bag when I was going out to dinner so it was a really versatile piece to take with me on my trip. 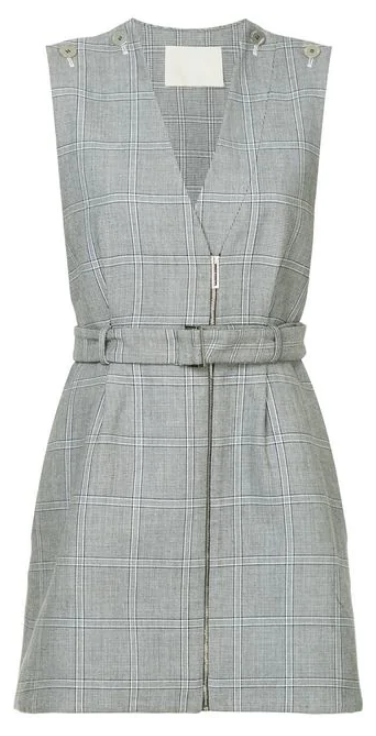 For one of my first strolls around Paris I opted for a great checked belted dress by Dion Lee. 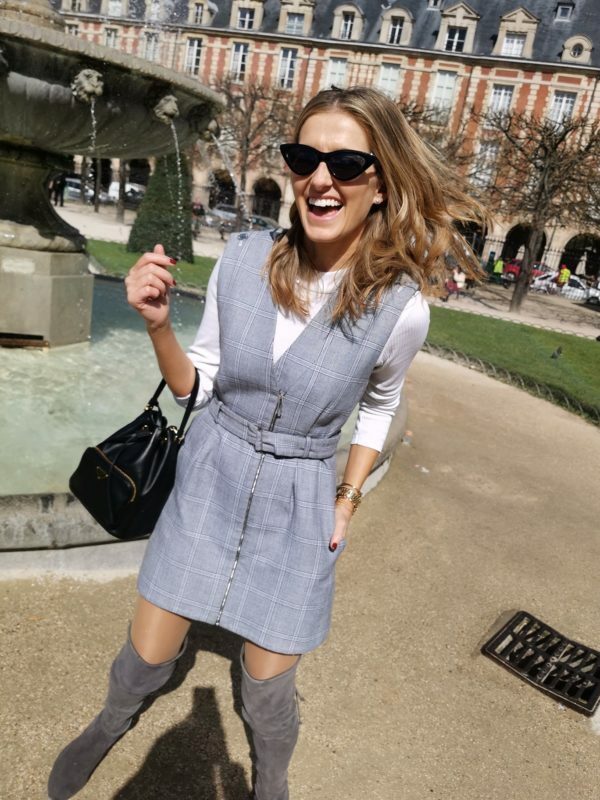 Given it was still a little chilly outside I layered it over a long sleeved white tee and paired it with my grey over the knee boots. When you’re travelling and have to dress for trans-seasonal weather I think boots are always a great option as they keep you warm but if it starts to get a little hotter you’re not left sweltering. 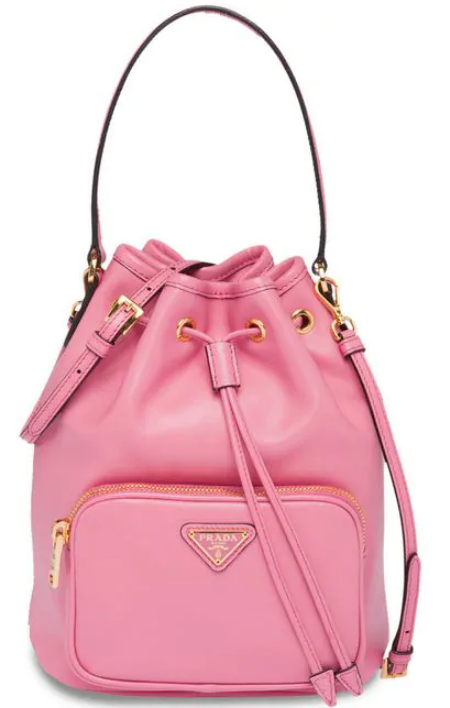 My Prada bucket bag once again made an outing as it’s the perfect size for sightseeing and is easily converted into a slightly dressier option by carrying it as a top handle bag. I think one of the golden rules of packing for a trip is to ensure that whatever is in your suitcase can be worn in myriad ways so you don’t end up having to take your entire wardrobe with you. We went out for dinner one night and I wanted to wear something dressy so it was the perfect opportunity to wear this chartreuse midi dress by Camilla and Marc. I love the simple and elegant silhouette of this particular dress but in such a striking colour it becomes a showstopper piece. It was a little cool to be wearing heels so black boots helped ground the look whilst still keeping me nice and toasty. 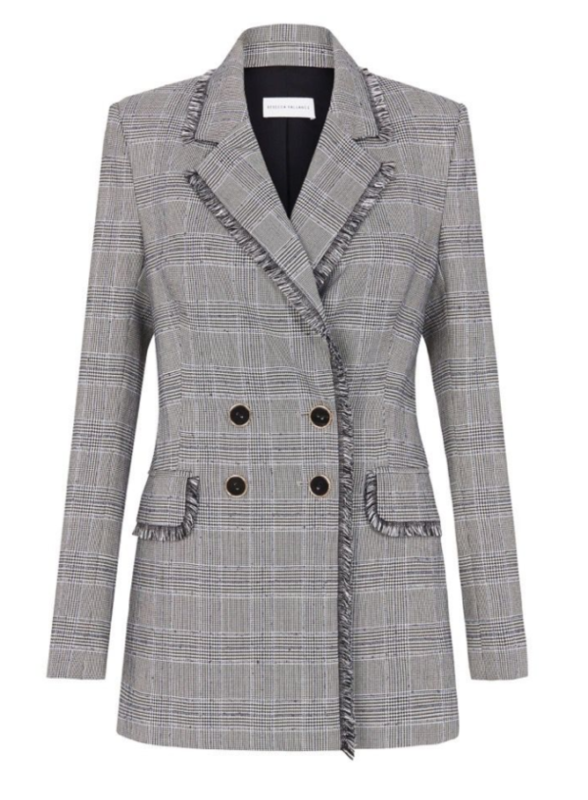 I brought this Rebecca Vallance suit along as I was able to wear it as separates with the jacket or pants paired with something else or as a set. Black suiting is always a classic option and it was the ideal outfit to wear out to dinner at a local restaurant. An all-black look when you’re travelling is a failsafe choice as it’s guaranteed to look chic and doesn’t require much fussing around. I kept my look quite simple, opting for black pumps and simple jewellery to channel a minimalist Parisian vibe. 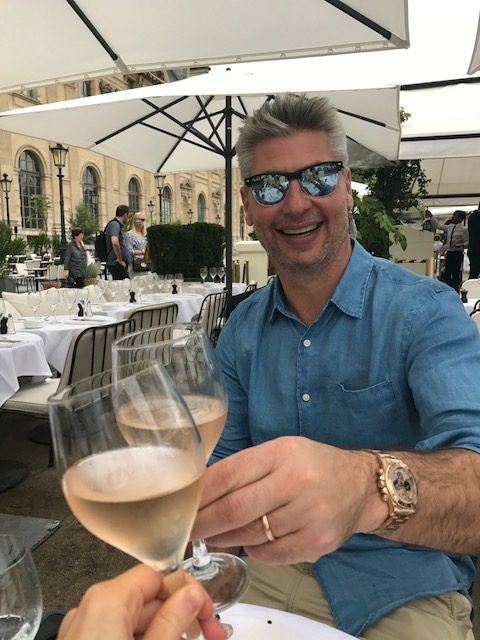 It’s not often you get to spend your working week hanging out in Paris, but that’s what I was lucky enough to be able to do over the the last few days. 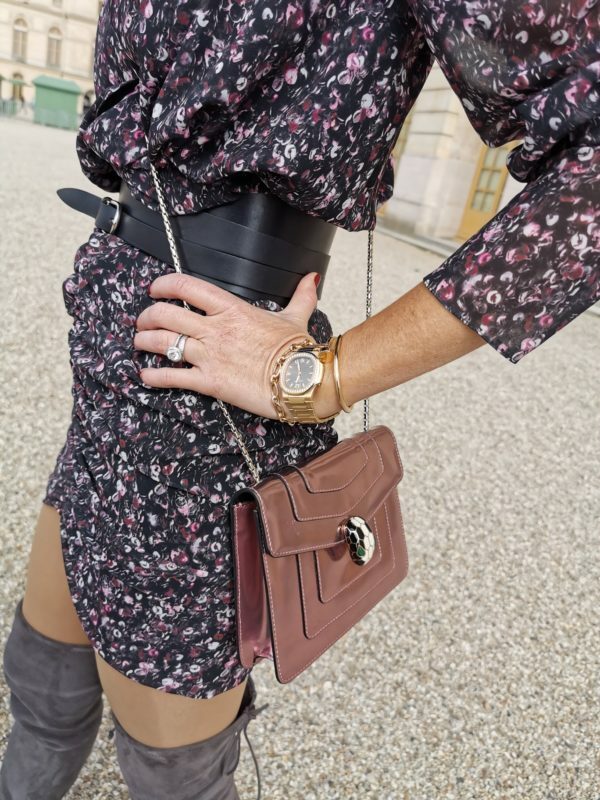 I was in the City of Light to celebrate the launch of the new Huawei P30 and spent my week taking in the sights from a cruise on the River Seine to visiting the breathtaking Palace of Versailles along with being able to take it all in with the help of my new gadget. PALACE OF VERSAILLES ✨ Had the most incredible day at @chateauversailles yesterday. (Swipe across for some of my pics taken with the new @huaweimobileau P30 #nofilter). 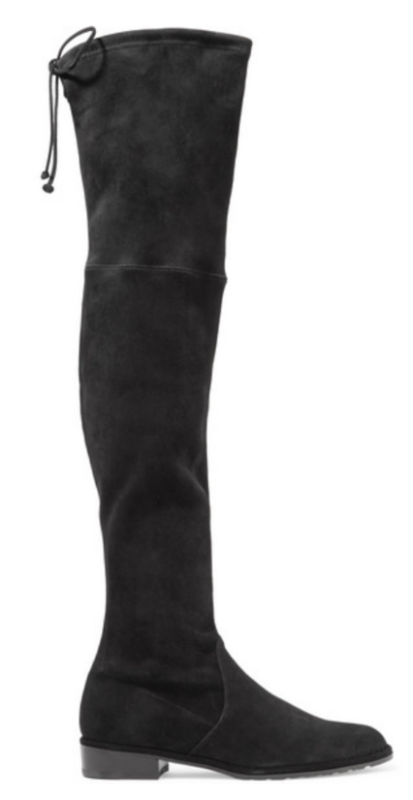 Wearing @dvf #fauxfur @stuartweitzman boots. 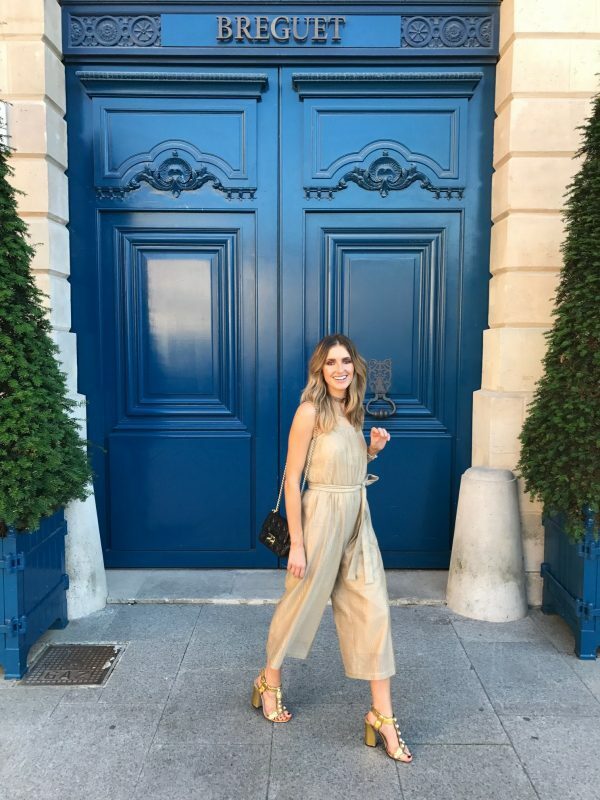 Now that it’s officially the time of year in Australia where everyone’s in the mood to go out and enjoy a few cocktails and make the most of balmy summer nights I’m once again drawn to this Rebecca Vallance jumpsuit. 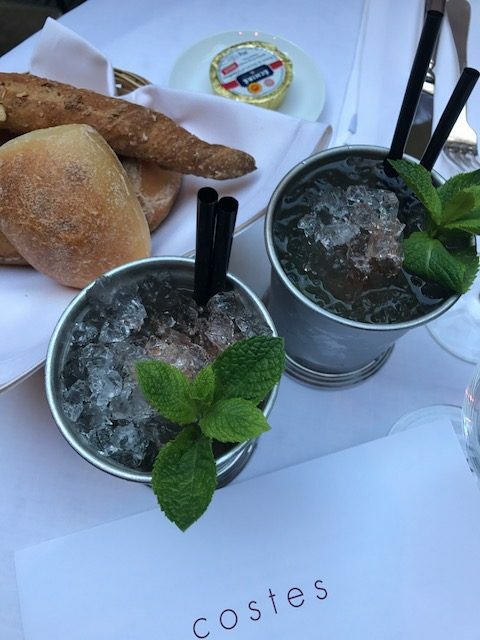 I took it with me to Paris during my last holiday and loved that it felt so right for evenings out, making the most of the gorgeous weather. 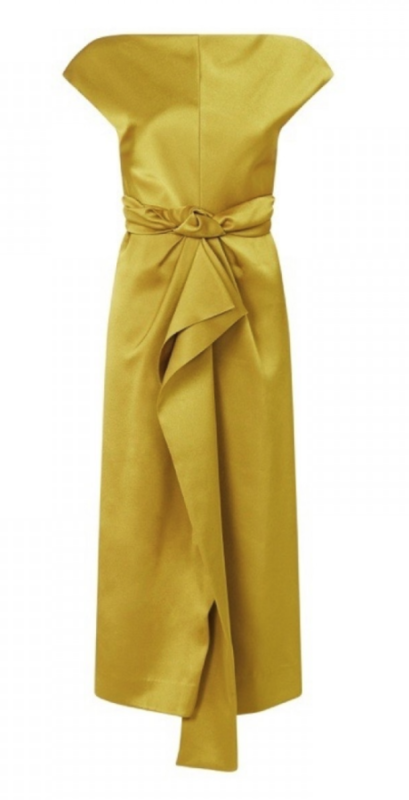 I’d usually associate gold lamé with more of a party look but the style of the jumpsuit, with its culotte style leg, square neckline and sweet waist tie keep it looking polished without losing any of its glam factor. The colour is so gorgeous that to continue the gilded theme I opted for my gold Gucci heels and favourite Eddie Borgo choker. 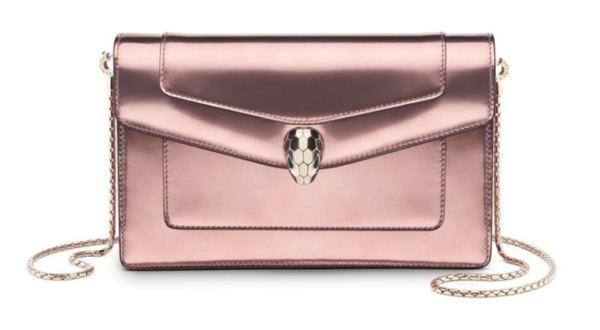 To punctuate the head-to-toe metallic I went with a little black Dior bag with chain strap to carry all my essentials and leave my hands-free should I wish to enjoy a drink or two! 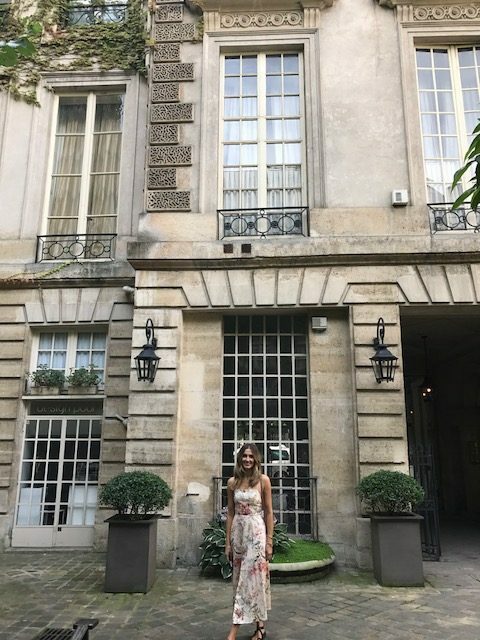 This is my favourite place to stay in Paris. It’s a gorgeous 17th century building, covered in ivy and looks straight out of a movie. It’s located in the Marais in the 3rd arrondissement which is one of the most picturesque spots in the city. A favourite of writers such as Ernest Hemingway and F. Scott Fitzgerald this is the place to grab a drink if you’re after a warm, cosy atmosphere and a killer cocktail. The beautiful outdoor setting is one of the major drawcards of this restaurant. It’s a lovely spot for a long lunch and is near the Louvré so it’s a great place to eat after a morning spent at the museum. Luke and I stayed here for our honeymoon so it’s a special place for us. We just had to visit and have a drink there to reminisce. 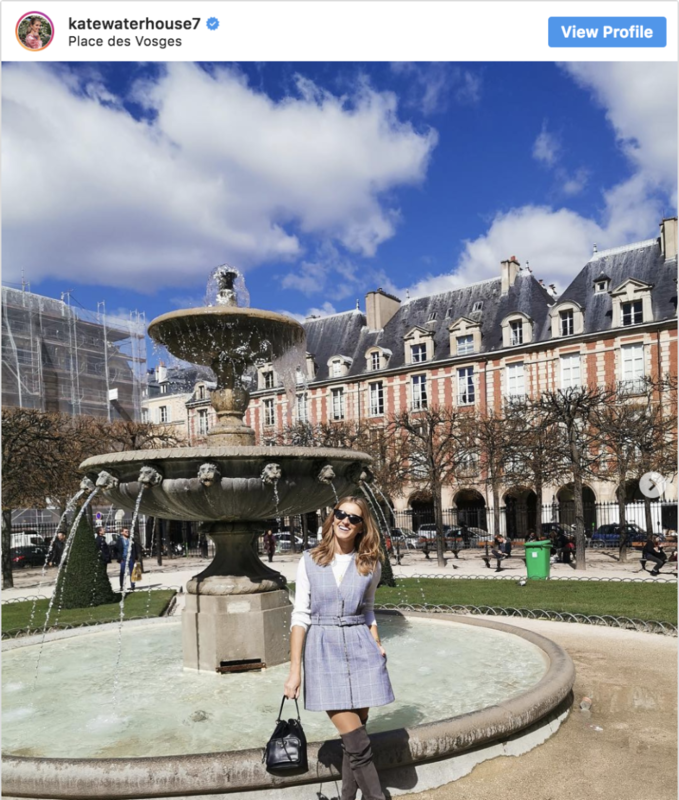 It’s located on the famous Avenue Montaigne which is heaven for any fashion lover. Shopaholics will love this upmarket department store that stocks every designer brand you could think of. If that’s not your thing the building alone is worth a look. I particularly liked this spot for the kids shopping. The range is amazing and extensive (there’s even a Disney store that would put a smile on any child’s face) and it’s hard not to want to buy everything in sight. This exclusive hotel has had a major refurbishment and is absolutely amazing. The big drawcard for any beauty lover would have to be the new Chanel au Ritz Paris. It’s a day spa that has everything you could possibly want in a pampering session such as massages and facials but is given the luxe touch that only those famous interlocking Cs can bring. It’s a roll call of designer stores at this shopping locale including Acne Studios, Stella McCartney, Alexander Wang, Oliver Peoples and Christian Louboutin. If you’re in the mood to stroll combined with a little retail therapy this is the place to go. If you want to enjoy some people watching (especially of the famous variety) this is the place to do it. 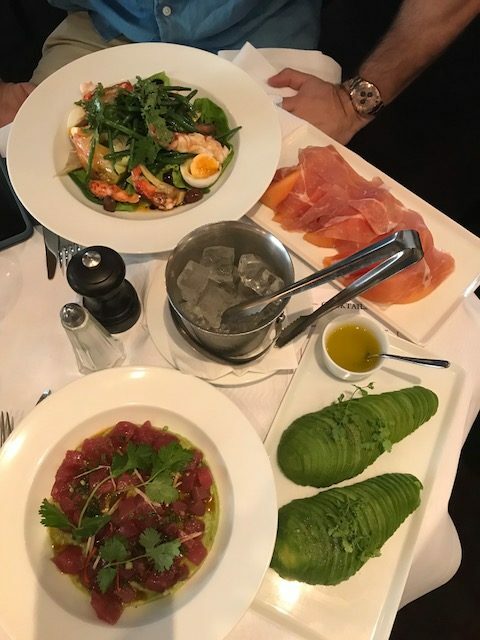 The clientele is always impeccably dressed so as an added bonus it’s great for admiring the often lauded Parisian style as you enjoy lunch. I spotted Anna Wintour there during my trip so you know it gets the tick of approval from the fashion set. This super exclusive department store is owned by luxury giant LVMH so the retail experience is next-level. The space is just so unbelievably chic that simply browsing is a joy in itself. 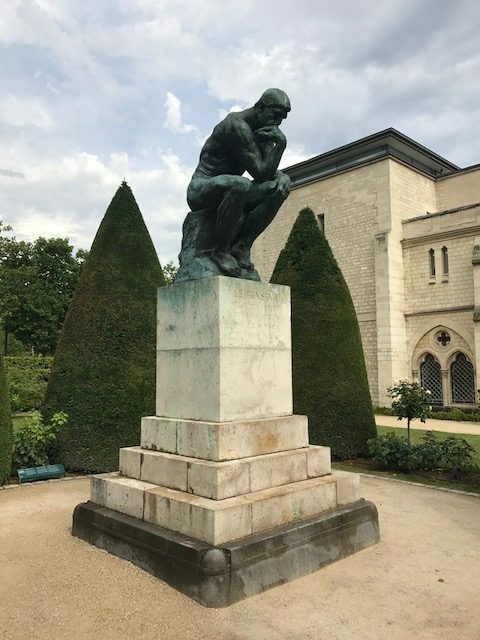 Home to one of the most famous sculptures in the world, The Thinker, a visit to this place is a must for any art lover. The gardens around the museum are also gorgeous and well worth a look. Great ambience and impressive interiors make this one of my top Parisian spots for dinner and drinks. Just be sure to leave enough room for this meal as you’ll be tempted to taste everything. We go here for dinner every time we visit Paris. It has great food and is a fashion industry/celebrity favourite so it’s also another excellent spot for people watching. A replica of the atelier of the artist Constantin Brancusi was first produced in 1977 opposite Paris’ cultural centre, Centre Pompidou. It subsequently flooded and closed before being reconstructed in its current incarnation by famed Italian architect Renzo Piano. If you’ve got time, it’s well worth a visit for the immersive museum experience. If you’re celebrating a special occasion such as an anniversary or milestone birthday whilst in Paris I’d highly recommend dinner at this restaurant. The food and dining room is on another level. Escape the city and do a day trip to the Palace of Versailles. The architecture is spectacular and everywhere you turn is Insta-worthy. If you’ve visited Paris what are your favourite spots or things to see and do? How could this week’s best celeb look be anything but this? 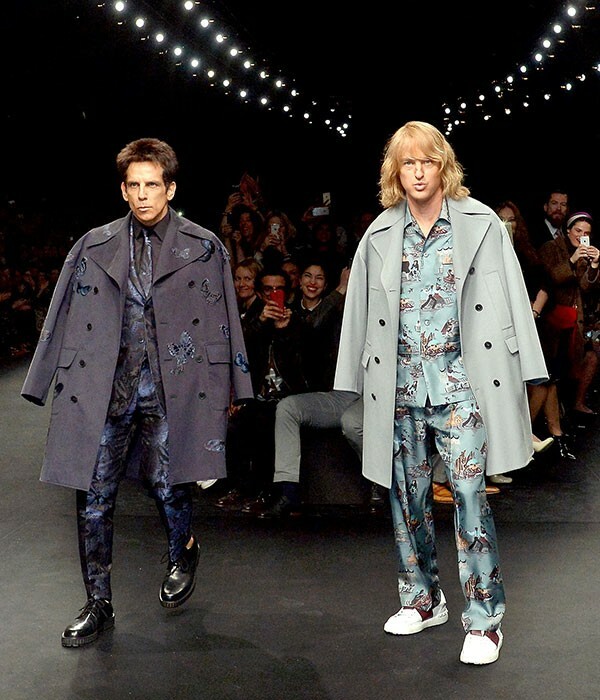 Ben Stiller and Owen Wilson at the Valentino show as Zoolander and Hansel was everything. Ellery presented its Resort 2014 Vitreous collection in Paris. 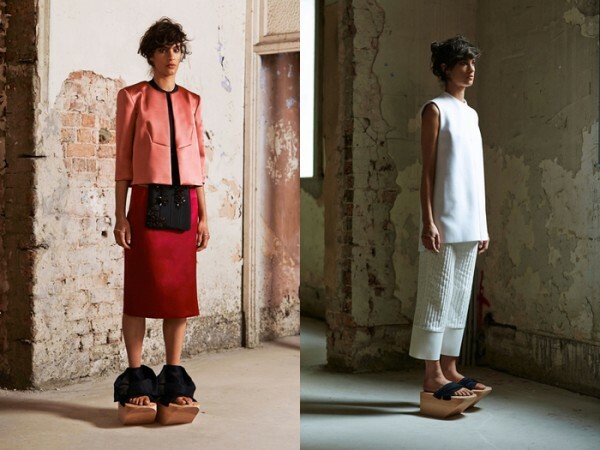 The collection has a Japanese influence with kimono references and was styled with modernised Geta sandals. 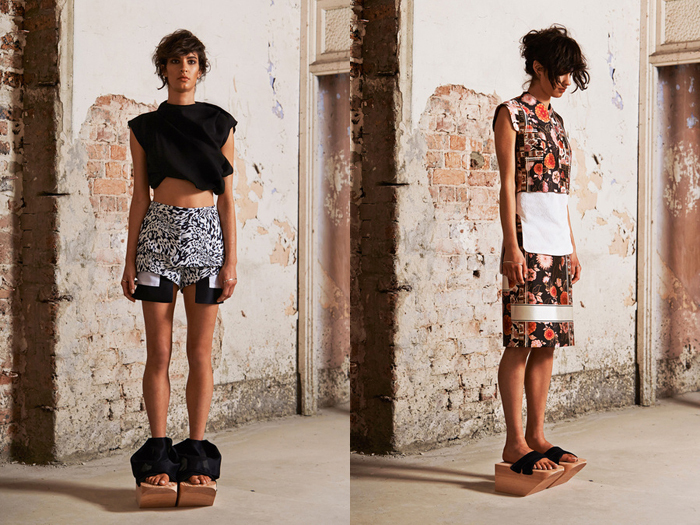 The collection consisted of beautiful tailoring, cropped pants and oriental inspired prints.